If you often like to relax in the company ofa bottle of wine, then most likely, you will accumulate a large number of plastic and cortical caps, which are an excellent material for creative products for home furnishing. What kind of crafts from bottle stoppers can be made with your own hands, and we describe in our article today. The basic material for crafts are cork, plastic and tin tubes, which are each at least once, but in his hands. They are available to everyone and do not require large material costs. With such an arsenal, you can begin to implement a wide variety of ideas. If you are the owner of a large number of caps with wine, then we can try to make an original decor for the doors. Such finishing both looks great and acts as insulation. One of the simplest options of craftsplugs, which can be used in the country and home delivery is a hot. Make her in the cellar. This would require about 30 tubes of equal length and glue. They need to be folded into a square and glue together using super glue. All stand ready! 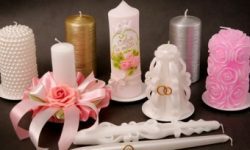 Crafts include not only home furnishingsBut also provide a variety of optionsdecorations. Thus, you can easily do with his hands pendant, necklaces, pendants and earrings. For example, the Israeli artist Yoav Kotik has long specialized in the creation of interesting youth decorations based on tin lids of various drinks. This proves once again that the creation of works of art have not necessarily expensive materials, but you can easily use what is at hand. Sheet metal covers can be inlaid oldfurniture. To do this, you must put on the surface of the desired pattern, attach separate cover, and then fill in the surface paint. 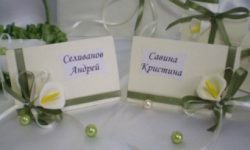 So you can give an old, ugly furniture and a new birth, it will serve you more than one year, and will also be of interest for all your guests. Having on hand a certain amount of wine corks can make an interesting box, which will be neizbity decoration for your home. To get started you need to draw on the cardboard drawingfuture box. After the cut workpiece, bend in the required field and make the shape of a casket. The inside of the upholstered product and secure it with glue. For exterior trim box must bepre-cut lid in half or into thin rings. Then, showing imagination, spread them in an arbitrary pattern. And the space between them is filled with the help of chips, which is obtained by rubbing the traffic jams on the grater. At the end of the box cover stain and varnish, and further decorate using twine. The resulting artifact fits perfectly into any interior, and can also be a great gift. 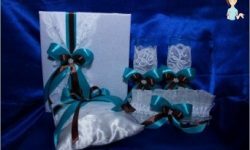 One option beautiful crafts made from corksChampagne considered various inscriptions that can be easily folded and seal with a transparent adhesive. This can be numbers, signs or elements of the festive decor. You can also fasten the lid in the shape of a heart, paint them red - and interesting gift for Valentine's Day is ready! One of the most popular and useful at the same timeideas is the mat for the front door. 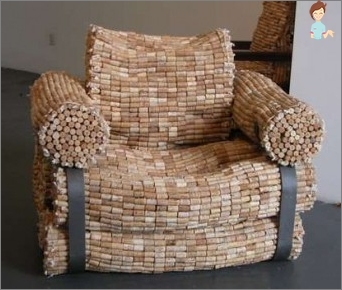 Make it possible by placing the cork, both vertically and horizontally. Hold them together, you can use glue or wire. Similarly, you can make and bath mat. In this case the basic material is water-repellent properties, which must be glued cork cut in half. In addition, traffic jams are an excellent soundproofing material, as well as help to insulate the walls, which is very important in the country. 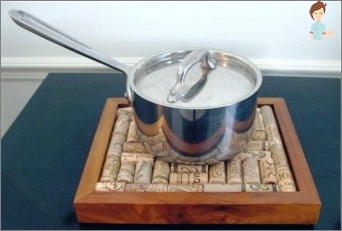 Crafts from wine and beer caps include unusual and most unpretentious decor picture frames. It is also possible to make the frame and to the ground. From the covers of wine can make miniaturepots for flowers, which you can decorate your refrigerator. To build them, you need to punch a hole in the material, and then attach the magnet and to fill the hole with soil. Then put them in the plant and can hang on the fridge. If you like to grow indoor plants, thewith plugs can be very unusual pot. The basis of the design is a plastic bucket in which sauerkraut sold in supermarkets. It needs to wrap twice folded cardboard. On board we will be glued blanks from the traffic jams. Pot placed inside a plastic bag, and placed on the bottom of small stones. Now you can pour into a pot of soil, and plant a plant. Options craft of wine stoppers from the mass,most importantly, to have on hand material. There is two ways: either a long time to save them, or order from a friend the bartender, which greatly speeds up the process. And then - huge scope for your imagination. Perhaps you think of a way to use the cover of plastic and beer bottles, and be able to brag to friends extraordinary crafts without significant cost. Be creative, and your house is full of interesting and beautiful things, because, as you know, creativity has no boundaries!